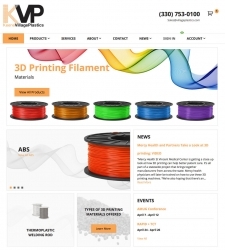 Keene Village Plastics is excited to announce the launch of its new website. Mayfield Heights, OH, April 04, 2018 --(PR.com)-- Keene Village Plastics is excited to announce the launch of its new website, www.keenevillageplastics.com. Formerly Village Plastics, the company has the largest production capacity in North America for 3D printing filament. Additionally, the breadth of the product line is greater than any other manufacturer. From their facility in Barberton Ohio, products can be purchased in many more varieties of polymer and color than any other source. Available polymers include, but are not limited to; ABS, Bronze, Copper, HIPS, Nylon, PC, PETG, PLA, 3D-Solve™ and wood.